Suitable for classroom use or self-study, this course teaches language learners how to use English in a commercial law environment. The book focuses on a variety of legal topics including contracts, company formation, debtor-creditor relationships and intellectual property rights. Using authentic texts to present and practise legal language, the course develops the four key skills of reading, writing, listening and speaking. 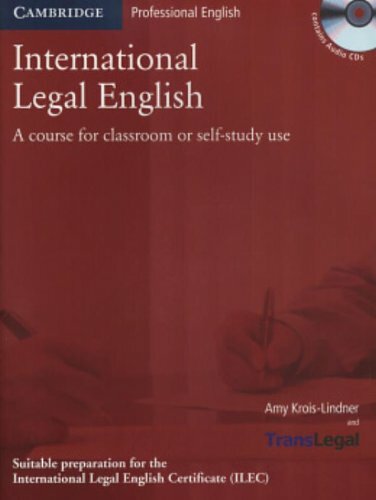 In addition, this course is ideal preparation for the new Cambridge International Legal English Certificate (ILEC) and contains exam practice tasks, exam tips and a practice ILEC test supplied by Cambridge ESOL. By: Ellinger, E.P. ; Lomnicka, Eva; Hare, C.